I've got two 4017's chained to create a 16 step sequencer as per the datasheet. Theres a 16 position rotary switch used to change the sequence length from 1-16 total steps. 3. Sequence length set by rotary switch. Using a double pole toggle switch (on - off - on). Hope any of this makes sense! Schematic attached. Does it work correctly when using only the rotary switch to select sequence length? That is, do the 8 and 16 glitches stop in rotary switch mode? If so, then why not eliminate the 8 and 16 switches and just use the rotary? Yeh it works fine with the rotary on its own. - pin 15 (reset) of 4017 #1 should have a pulldown resistor. - pin 5 of the 4066 is always high. - there are a couple of unnecessary diodes. I haven't really looked into how and why it works/doesn't work but I cleaned up the schematic a bit. I am pretty sure U3b can and rather should be discarded. It can probably also be slightly simplified with a mux. 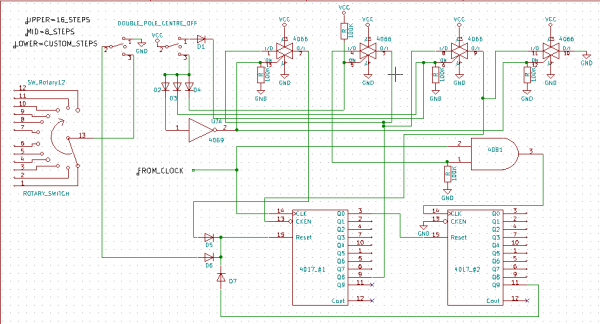 I'm impressed how tidy you made the schematic look Phobos! Thankyou for doing that, and for the general sense-check. I think there might be one or more errors in the schematic you posted as I don't see how the 8/16 step modes could work. In rotary mode or 16 step mode, the 4066 is opened and the latch does not get set HIGH by pin 2. 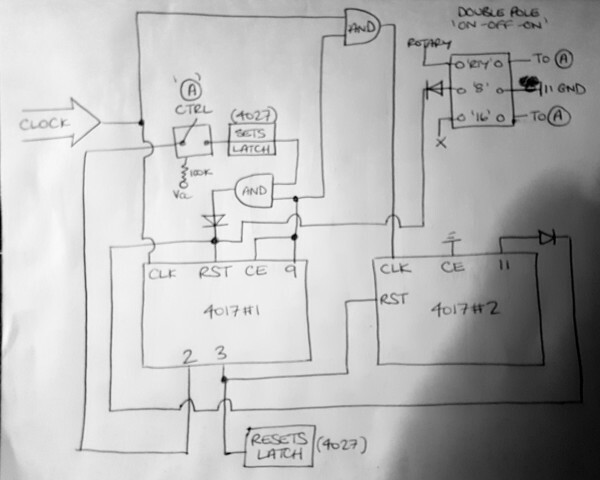 The reason it glitched when going from 8step to rotary modes was if the sequence was already past the rotary reset point, then the sequencer had no instruction to reset itself. The reason the sequencer reset when changing from 16step to 8step mode was that the clock inhibit on 4017#1 was being sent low by changing to 8step mode. This started the clock again on 4017#1 which reset itself after pin 11 (after all 10 steps of the 4017 had finished) which reset the whole sequencer. I fixed this using latches for both: set on step 1 and reset on step 2 but only when in certain modes. For this i just used a 4066 switch to either allow or prevent the latch from resetting itself. This meant that changing modes only happens once the previous mode has run full cycle and can be set again on step 1. Bit of a pointless post tbh but I was really pleased! Here's the schematic. Hope it makes sense. If anyone can spot any redundant parts please let me know. for designing digital circuits. Then you can first try to clean it up yourself which I think would be more helpful. ok, I made a thread which might help you a bit.